Amazon.com is an international e-commerce company offering online retail, computing services, consumer electronics, digital content as well as other local services such as daily deals and groceries. Amazon is the leading online retailer in the United States with almost 178 billion U.S. dollars in 2017 net sales. The majority of the company’s revenues are generated through e-retail sales of electronics and other products, followed by third-party seller revenues, subscription services and AWS activities. Amazon Prime is an annually or monthly paid membership which is part of the company's subscription service segment. Prime offers customers a wide range of exclusive offers, ranging from subscriber-only digital content to free two-day shipping in the United States as well as discounted one-day shipping rates, which many current users regard as the key reason for subscribing to the service. As of June 2018, there were approximately 95 million Amazon Prime members in the United States. Industry sources estimate that 59 percent of Amazon customers in the United States were Amazon Prime members, up from 47 percent in December 2015. Initially launched in 2005, Amazon Prime has since opened to other countries and has also expanded to offer instant streaming of selected movies and television shows through Amazon Instant Video as well as music streaming. The average annual Amazon shopping expenditure of Amazon Prime members was found to be 1,400 U.S. dollars on the online shopping platform every year, compared to 600 U.S. dollars spending of non-Prime members. The most popular product categories of Amazon Prime shoppers in the United States were electronics and physical books, followed by e-books and personal care products. 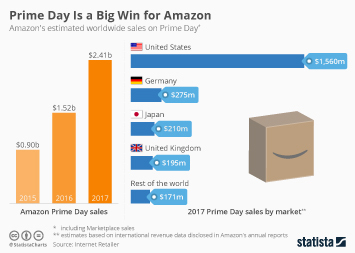 On July 15, 2015, to commemorate its 20th birthday, Amazon celebrated Amazon Prime Day, which Amazon announced would feature deals for prime members that rivaled those on Black Friday, or rather, in the case of e-commerce, Cyber Monday. During an online user survey ahead of Amazon Prime Day 2018, 76 percent of Amazon Prime members stated that they were planning on taking advantage of the sales, with a third of respondents willing to shop online during Prime Day at work. In 2017, Amazon reported a 60 percent annual growth in Amazon Prime Day sales, making it the company's most successful online shopping day ever - the record was broken on Prime Day 2018. Another successful entry in Amazon's selection of products is Amazon Video. It offers films and television shows for rent or purchase and as part of Amazon's Prime subscription, selected titles can be viewed exclusively to full Prime or Prime Video members, in which video membership allows viewing without full Prime. It is a direct competitor to Hulu and Netflix. In 2017, 44 percent of OTT video service users in the United States were using Amazon Prime Instant Video, with the platform's original content steadily gaining in popularity. That year, Amazon Studios were also nominated for 15 Primetime Emmy Awards.